Navigating customs clearance can be an arduous journey whether you are a novice or a veteran importer. The anticipation of an arriving shipment and the angst of worrying about the logistics is not for the faint at heart. However a glitch with things like the U.S. customs bond verification process can halt everything. When it comes to importing, documentation rules the day. All cargo arriving or departing through any U.S. port must have a trail of documentation required for customs. Imports valued over $2,500 intended for commercial use must have a customs bond on file with Customs Border Patrol. It’s just one step of many needed to clear customs. Let’s take a look at the U.S. customs bond verification process and what is involved. A customer looking to import goods may seek the assistance of a customs clearance firm. Customs brokers will work to obtain a variety of details from the importer in order to file the necessary documents. One of the tasks the clearance broker will do is attempt to verify if the importer has a bond. This step, the U.S. customs bond verification process, is critical in the documentation phase. It takes a quick query of a database to determine if an importer has an assigned bond. The broker just needs a federal tax identification number, or an Employer Identification Number (EIN), an IRS number or the importer’s individual Social Security Number to query the system. This number is also referred to as the importer number. It takes mere moments for the broker to confirm if the importer has a bond. A customs broker, attempting to work with an importer can do little without a tax identification number. It’s time to pause the customs clearance application until tax identification can be obtained by the importer. There is a list of information and documentation any customs broker will need to assist customers. It’s a detailed process and all documentation is required. A customs broker can assist customers with a number of documents except the tax identification. The federal government is the only agency that can issue tax identification. Once that number is secured by the importer, then the broker can complete the U.S. customs bond verification process. If the customs broker is able to determine the importer has a bond on file, they can proceed with the customs clearance application. However, if an importer is without a bond, the broker can offer a quote to write one for the customer. Generally two types of bonds cover goods being imported into the country. An annual bond will cover importers expecting multiple shipments over the course of a year through any port. In contrast there is a bond to cover single shipments to a specific port. Customs bond – also known as a continuous bond allows an importer to have shipments arrive through any port during the balance of a year. Single entry bond – is as the name implies covers a single entry. These bonds are good for a specific shipment arriving through a designated port. Additionally a single transaction bond can cover up to five import shipments within a 12 month period. Often a customs broker spends time educating importers about the process including bond issuance. The broker may offer services pending the outcome of the U.S. customs bond verification process. A customs bond broker can actually write the bond in conjunction with the surety company. A customs bond is required for all imports entering the country. There is no way around this fact. There is also no way to get anything done regarding customs clearance without a tax identification number. The U.S. customs bond verification process will let brokers know the bond status of an importer. 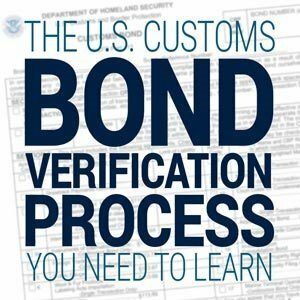 In working with a customs broker, the U.S. bond verification process is just one part of the overall process. Customs clearance is very detailed and requires specific information for this document driven side of business. A bit of advice to importers is to know the product they are intending to have shipped. In regard to the product, know the details about the materials used to make it and other components. Seemingly insignificant details like a plastic zipper versus a metal zipper can mean the difference in customs duty and taxes. Importers will ask a customs broker how much duty, taxes and fees will be for a shipment. The Customs Border Patrol (CBP) is the agency that sets the rate of duty, taxes and fees at the port of entry. However, a broker can give an estimate based on what the products in the shipment are made of. Another good piece of advice for importers is to know who they are buying a product from to avoid problems. It’s the responsibility of the importer to be proactive in this process. Brokers also encourage customers to be on top of their business affairs, especially when it deals with importing. Missing information for documents means a lag time in getting the customs clearance application processed. And in business lost time equals lost money. Information is power, the more the importer knows about their cargo and can pass details to the broker the better. Likewise brokers can make sure importers are knowledgeable and aware of any updates impacting the process. Brokers can work with clients to let them know what all is needed to get the ball rolling. Working with first-time importers is a lengthy process to obtain all the information needed. Whether clients import on a regular basis or it’s a new venture, it’s necessary to stay in constant contact with the broker. There are details the broker will need from the importer and likewise the importer will seek answers to a number of questions. There is no hard and fast guideline of how long the application phase can take to complete. While it could take half of a business day to finalize an application; it could be extended by several weeks. Everything is based on the flow of information between the broker and the importer. This point is driven home with the U.S. customs bond verification process. 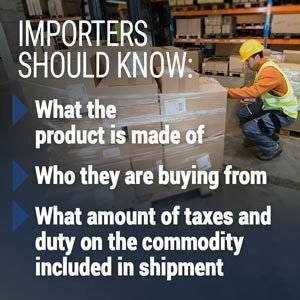 If an importer cannot provide a federal tax identification number, the customs broker is unable to help them. The CBP reviews the documentation of all import shipments. Any importer whether an individual or business must have a federal tax identification number issued by the Internal Revenue Service (IRS). It is this number that enables the CBP to identify any importer in the database. The IRS provides a unique nine-digit number to businesses or individuals that is used for identification. Once this number is issued it will not change. While this federal tax number has many uses, it is the only way a broker can conduct the U.S. customs bond verification process. However if the importer opts to go it alone and neglect to provide a tax identification number, the CBP will flag the shipment at the port. The shipper or exporter in the country of origin can also determine that a U.S. tax identification number is on file for the importer. This can be accomplished by what’s known as Customs Form 5106. Importers must have this form on file at the time a shipment reaches a port of entry. A customs broker can assist clients in filing Customs Form 5106 with CBP to document the name of an importer, a physical street address, and Tax ID. It is important to note that Form 5106, with the tax number from the IRS, remains active unless the importer lets more than a year elapse since receiving cargo. The form will need to be updated, thus reactivating the importer’s federal tax identification number. Let’s talk about the numbers and the overall function. Yes, even if you are using a customs broker to import goods, it’s a good idea to know what everything means. Applying for a bond the importer can use either an EIN, Federal Tax ID, or IRS number. Generally one of these numbers is used on the application for specific conditions. If applying for a bond using a company name then typically the importer will use an EIN, Federal Tax ID or IRS number. In most cases an importer will only use a Social Security Number (SSN) if the bond application will be in their individual name. To cover instances where an issued EIN or SSN is not available, an alternative can be what’s referred to as an importer number. With any of these unique numbers a broker can quickly access the information via the U.S. customs bond verification process to assist clients. A special note of caution here, make sure to verify the number on all documents. If there is a mistake and one number is out of place it may result in the CBP possibly seizing the shipment, inspecting it and assessing fines. Play it safe and check your numbers. In order for a customs broker to run a bond verification, they will also need the correct EIN or Tax ID. So what happens if the entity looking to import does not have a tax identification number or EIN? Remember a customs broker will not be able to assist clients with obtaining this critical number. And without it, the broker is unable to conduct the customs bond verification process. Obtaining an EIN or tax ID number from the IRS is a step the importer must complete independently. The first stop is the IRS to review what is involved to start the process and get a list of the required documents. The IRS outlines how to apply for an EIN and provides answers to a host of questions. EIN applicants must operate a principal business within the U.S. or within a U.S. territory. There is no fee charged for obtaining an EIN number through the IRS therefore it’s advised to avoid companies attempting to collect a fee. The CBP offers a variety of tips for new importers. There are a few basics that should be reviewed along with other guidelines to cover specific import situations. -There is a 15-day window of when CBP entry forms must be in place for the arrival of an import shipment. -Documentation of a bond must be on file with CBP for the imported goods to cover duties, taxes and fees. -Importers need to be aware of CBP policies related to the commodity being shipped. -Provide an importer number or EIN where required. In 2016, the CBP logged 32.6 million import entries into the U.S. totaling $2.28 trillion value. 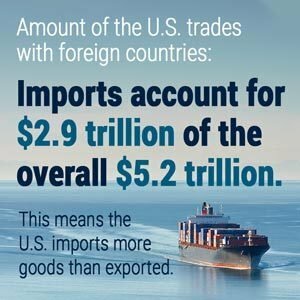 According to an article published by The Balance giving an overview of the amount the U.S. trades with foreign countries, imports account for $2.9 trillion of the overall $5.2 trillion. That means the U.S. imports more goods than are exported. In addition, automotive imports which includes vehicles, parts and engines represent about $359 billion. Also on the list are $138 billion in food and beverage imports. Computer chips – most are already embedded in cellphone, computer, etc. So as you can see, a lot of goods pass through U.S. ports for a variety of commercial use. And as each importer works to get items cleared, they often work with customs brokers. The broker can do a number of tasks including the U.S. customs bond verification process and file a variety of required documents. Yes, there are many layers of documents required for importing. However, there are a few things that will be listed repeatedly throughout. The main piece of information needed will be the importer number or the tax identification number. The bulk of what it takes to get an import from the point of origin to a U.S. port of entry and cleared by customs requires an importer number. It’s that important and not much can happen without it including the bond verification process. For starters the importer number needs to be listed on all required documentation associated with the shipment. These are the documents the customs broker will request to work on behalf of the importer. The importer number should also be listed on the CBP Form 7051 or an Entry Summary and the Commercial Invoice. In addition to the standard information required for importing, other documents may also be required depending on the commodity. The import number will need to be listed where required including the bill of lading or air bill, import license when required, insurance certificate and purchase order or letter of credit. 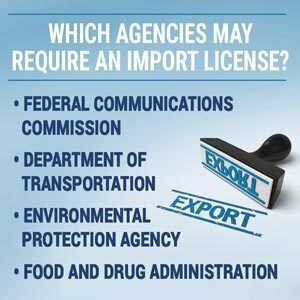 As for whether an import license or permit is required, it will depend on the government agency that regulates the commodity being shipped. The licensed customs bond broker covers a lot from using the tax number to conduct the U.S. bond verification process to ensuring all documentation is filed. This is an important step and a special eye for detail is needed. Licensed customs bond brokers with USA Customs Clearance are able to help importers make sure all documents are in order for imported goods. Importers can then breathe a little easier knowing their licensed customs bond broker is working for them. 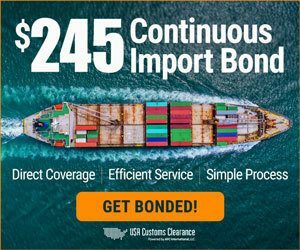 Connect with USA Customs Clearance today if you still have questions about the U.S. bond verification process or want to have a licensed customs broker work on your behalf.